Leisure company Whitbread is to sell its David Lloyd gym chain for £925m. 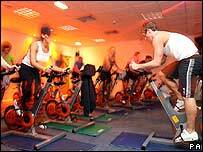 The health clubs are being bought by Versailles Bidco, the bid vehicle of private equity firm London & Regional Holdings and Bank of Scotland. Whitbread, which owns the Costa Coffee, Premier Travel Inn and Beefeater chains, said it planned to use the cash to reduce its debts. The sale of David Lloyd Leisure follows Whitbread's disposal of TGI Friday and its 50% stake in Pizza Hut. "Following the success of the management action taken in David Lloyd over the last 18 months, and a review of the health club market, we have decided that this sale represents excellent value for our shareholders," said Whitbread chief executive Alan Parker. "Whitbread is now well placed to deliver the ambitious growth plan for its hotels, restaurants and coffee shops." The David Lloyd chain has 69 outlets, of which 60 are across the UK and the Republic of Ireland. It was originally set up by tennis player David Lloyd in 1982, who sold it to Whitbread for £182m in 1995.